Raise your hand if you love to network. So how many hands do you see? Anyone? Bueller? Now raise your hand if you like to help people. Raise your hand if you like to share what you know. Raise your hand if you like to support your friends and colleagues. There’s a pretty clear difference in the number of hands we’re going to see. Yet we’re really talking about the same subject. One of Kelly Hoey’s greatest contributions in her book, Build Your Dream Network, is the compelling way that she reframes networking—and what it can be. She takes a concept that can feel distasteful, empty and insurmountable and turns it into one that feels warm, generous, and most of all, doable. Reading Build Your Dream Network, I found myself taking a broader look at the ways that I connect with people and began giving myself more credit for things I actually like to do. How great that my update on LinkedIn praising a colleague’s article can actually “count” as time spent networking. What a relief to know that when I make myself go to a networking event, I’m allowed to re-connect with a single person, have a meaningful conversation and call the evening a success. How cool that helping my colleague’s daughter learn more about Cornell, my alma mater, counts as networking too. Passing on information, helping people solve problems and building relationships are actually things I enjoy. In fact, I usually do them without even thinking about networking. It’s an interesting irony that the times when we would most benefit from accessing our network are often the same times where our self-confidence may be at a low point. In a career transition, it’s easy to second-guess our strengths and experiences. When trying to build new business, it’s sometimes necessary to focus on less familiar skills rather than those we do well already. Most of us don’t like to ask for help, especially when we are feeling needy. What Kelly demonstrates is that if we regularly invest time and resources in our colleagues, friends and more distant contacts, then we can harness the power of our network from a position of strength … and when we ask for help, we’re likely to be met with enthusiasm and generosity in return. For these invaluable nuggets and a many others, Build Your Dream Network has become one of my favorite books to recommend to coaching clients, whether they are transitioning in their careers, re-entering the legal profession after a career break, looking to advance internally in their firms, or working on business-development goals. You’re a former practicing lawyer and talent manager in large, international firms. What are the networking challenges and opportunities that may be unique to women lawyers in this environment? Time is the greatest challenge – especially when we limit the concept of networking to client dinners, industry conferences and business receptions. Who has time for all that (when you’re juggling billable work and trying to scrape together a personal life)? Those activities are just one marketing aspect of networking in a professional environment. If however, you begin to think of networking as the regular, on-going communications and interactions you have with others, there are more opportunities to make powerful connections to advance your career. As I share in Build Your Dream Network: Successful networking requires understanding the immense power of regular daily activities to connect with someone else. How you present yourself in any of these “networking en-counters” is as important as a VIP invitation, a solid handshake, or a slick elevator pitch. What would be useful for us to know about “new networking” and the idea of sharing what you know, both inside and outside of the firm? We live in an era where it is not who you know, or what you know but who knows what you know. No one is going to “pick” you simply for doing the good work – you have to let the world know you’re doing the good work. Building relationships with colleagues within your firm (whether working on a committee or actively seeking out assignments with colleagues across offices or practice groups) should be part of your career strategy – as much as co-authoring articles, sending client updates or sharing your point-of-view on a regulatory change on LinkedIn. To advance your career you need a network – and that network needs to know what you are uniquely able to offer. You’re familiar with the On Ramp Fellowship, a re-entry platform that matches experienced women returning to the workforce after a career break with law firms, legal departments, and financial services firms in the U.S., Australia, and the UK for six to twelve month paid positions. What are the networking challenges and opportunities that might be unique to this group of lawyers? First, sharing the On Ramp experience with their existing network. Your existing network is the one that cares most about your success and wants you to succeed! Bring them on this new career chapter with you by sharing your On Ramp stories. Second, building a network within the new work environment. Our first instinct when we dive into a new career is to focus exclusively on the work – especially when we’re trying to get up to speed or learn new skills. Don’t allow the “I have work to do” get in the way of building relationships in the workplace. 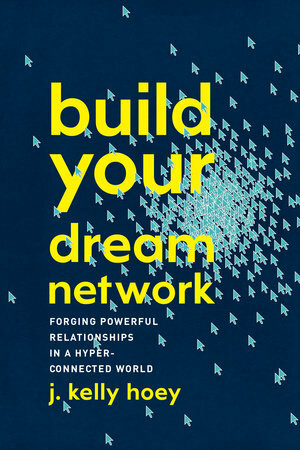 In your incredibly useful book Build Your Dream Network, you caution against “random acts of networking” by setting a goal and identifying connections who can help you to reach that goal and you offer a number of tactics. What tactics do you recommend for an On Ramp Fellow whose short-term career goal is to get a permanent offer at their firm? Random acts of networking for me are those networking events we show up to or associations we join without asking “why”. If your networking goal is to land a job then start by figuring out how hiring decisions are made – then plot a networking strategy from work assignments, to office location, to committees, to lunch & learn sessions to networking receptions you need to calendar in and commit to – as connecting with the people behind the hiring decisions is as important as delivering quality work. Success is a team sport, so build the team to help you get hired. You talk in your book about generosity as an important networking concept. What does that look like for a re-entering lawyer? How can re-entering lawyers find ways to experience a “return on generosity” and meet colleagues unmet needs? A lot of people are likely going out of their way to help you succeed as a re-entry lawyer. The most generous thing you can do is follow-up with them! The failure to follow-up is the biggest networking mistake. If someone has helped you with advice or guidance, let them know how you applied it! If they made an introduction – tell them what happened when you met that person. Following-up is the most effective way to build strong relationships. Many re-entering lawyers took time off to raise children and have many friends who are fellow parents. How can parents (or anyone really) turn their friends into members of their business network? Can you give examples and specifics about what those conversations might look like? Remember that like you, the parents in your network have more interests than arranging play dates, sending birthday invitations or scheduling car pools. Talk to them about what you’re doing with your career – and discover who they are beyond someone’s mom or dad. If you could give one final piece of advice to reentering lawyers what would it be? Stacey Schwartz is an executive coach and career strategist. She partners with organizations to inspire and support peak performance, particularly among high performing women. She has coached hundreds of professionals, helping them to develop skills, habits, self-awareness and confidence that transform behavior and maximize impact. Stacey has developed and delivered interactive, customized training on a range of topics including career strategy, performance management and feedback, mentoring and sponsorship, business development and networking, reducing unconscious bias and career re-entry. Stacey draws on 17 years as a lawyer and trusted advisor to leaders of large international law firms. She practiced law at Davis Polk & Wardwell and Akin Gump Strauss Hauer & Feld and has held senior positions in professional development and diversity and inclusion at the law firms of Weil, Gotshal, & Manges, Skadden, Arps, Slate, Meagher & Flom and Proskauer Rose. She holds a JD from New York University School of Law, a BA from Cornell University and has been trained as a coach by the Coaches Training Institute.